Happy Halloween! Tim and I have been celebrating the eeriest day by watching Stranger Things, but most years I try to read something a bit on the spooky side. October has been so mild it has barely felt autumnal (though the colours are amazing) so it’s only now that the clocks have changed and the evenings are long and dark that I am starting to yearn for ghost stories. What I have read this month has been fairly eclectic, not least because I have working on filling out my Books on the Nightstand Book Bingo card. I’m currently three-quarters of the way through two books for that – a popular-science title and a random book picked off the shelf. I even shut my eyes! How was your October? Did you pick out a special Halloween read? This book has been on my TBR for about 12 years. I knew enough about the subject matter to expect a tough read so I kept on passing over it. It was actually much more readable than I had expected, but that doesn’t negate the difficult subjects covered. The lead character is David Lurie, a middle-aged university professor in Cape Town whose specialism of modern languages is no longer on the South African syllabus so he teaches communication instead. His is a limp life, teaching without pleasure, amicably divorced, as good as estranged from his daughter. Even his regular trips to a prostitute are without passion. Indeed, he is impersonal enough with his regular prostitute Soraya that when one day he sees her in a market with her two children, it throws him off balance. He finds he can’t interact with her in the same way any more and she elects to stop seeing him. Here we get the first clue that David is not especially nice or trustworthy, because his reaction to Soraya’s disappearance is to hire a private detective to find her so that he can phone her and disturb her home life. Here in the UK, October is Black History Month. For more than 35 years, October has seen a “nationwide celebration of Black History, Arts and Culture throughout Britain”. Locally to me, here in Bristol, events include music, theatre, film, workshops and exhibitions, many of which sound fantastic. The month will end with Bristol Somali Festival, a week-long celebration of Somali identity and heritage. While I am excited about all the arts and culture events, to me the heart of Black History Month is the history part, and for that I am inclined to turn to books. There are many to choose between, from important people in Black history, to the multitude of stories of Africa, to slave narratives, to the experiences of Black people and communities outside of Africa. In case you haven’t noticed, Netflix released its latest Marvel TV series, Luke Cage, on 30 September. Like its predecessors Daredevil and Jessica Jones, it is excellent. But what caught my eye in the early episodes is that Luke Cage is not just a big-hearted bulletproof superhero, he’s also an avid reader. The first clue was early in episode one, when between finishing a shift at one job as a hair sweeper at a barbershop and starting a shift at his other job as a washer-up, he stops by a news stand to buy a copy of the New Yorker. Scenes of Luke’s apartment show stacks of books on every surface and when he’s not fighting baddies he likes to discuss detective novels. What really made me pay attention was that first clear shot of a book cover. The book in question? Invisible Man by Ralph Ellison. This seemed like exceptional timing. While on holiday, Tim and I went to the art gallery C/O Berlin where the main exhibition was the work of photographer (and film director) Gordon Parks, including his partnerships with Ralph Ellison, such as Invisible Man. I’ve been meaning to read the book for years, but now I’ve seen the powerful accompanying photographs, I want to more than ever. So I did what I do. I made a reading list of all the books and authors mentioned or shown in the whole series. Enjoy. 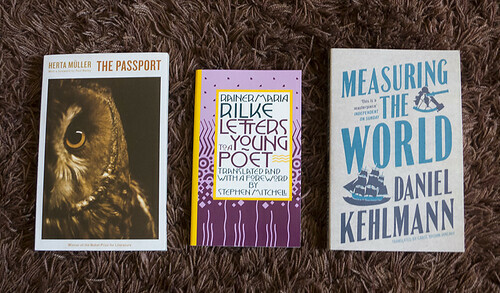 I bought some books in Berlin. Because, of course. I feel a little guilty because I read less than half a book while on holiday, but on the other hand, lovely new books! They’re all translations from German and all look great. I only knew of one English-language bookshop in the city before our holiday, but we did stumble across a few more bookshops with small English sections.